Winner of the Pulitzer Prize, and now a documentary from Ken Burns on PBS, The Emperor of All Maladies is a magnificent, profoundly humane biography of cancer--from its first documented appearances thousands of years ago through the epic battles in the twentieth century to cure, control, and conquer it to a radical new understanding of its essence. Physician, researcher, and award-winning science writer, Siddhartha Mukherjee examines cancer with a cellular biologist's precision, a historian's perspective, and a biographer's passion. The result is an astonishingly lucid and eloquent chronicle of a disease humans have lived with--and perished from--for more than five thousand years. The story of cancer is a story of human ingenuity, resilience, and perseverance, but also of hubris, paternalism, and misperception. 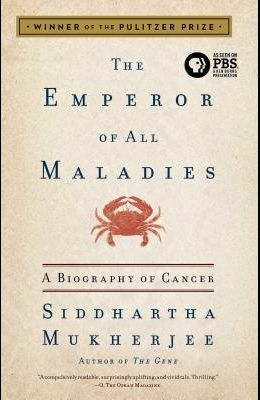 Mukherjee recounts centuries of discoveries, setbacks, victories, and deaths, told through the eyes of his predecessors and peers, training their wits against an infinitely resourceful adversary that, just three decades ago, was thought to be easily vanquished in an all-out war against cancer. The book reads like a literary thriller with cancer as the protagonist. From the Persian Queen Atossa, whose Greek slave may have cut off her diseased breast, to the nineteenth-century recipients of primitive radiation and chemotherapy to Mukherjee's own leukemia patient, Carla, The Emperor of All Maladies is about the people who have soldiered through fiercely demanding regimens in order to survive--and to increase our understanding of this iconic disease. Riveting, urgent, and surprising, The Emperor of All Maladies provides a fascinating glimpse into the future of cancer treatments. It is an illuminating book that provides hope and clarity to those seeking to demystify cancer.